The news was revealed by the Times of India, which published part of a leaked government document. It said officials appeared to have dropped demands that the firm also made it possible to access business emails sent over Blackberry Enterprise Server. In 2010 the country had threatened to impose a ban on Blackberry devices, saying its secret services needed to be able to access suspects' messages and have the keys to decrypt them in order to prevent terrorist attacks. Blackberry has always said it does not have a "master key" or "backdoor" that would make encrypted corporate information sent through its service accessible either to itself or law enforcers. The Times of India said the government now appeared to be "content" just being told which firms were using the Canadian company's Enterprise services. The paper said it had seen an internal document from the country's Department of Telecommunications, which read: "Barring a few minor points for improvement of viewers, the lawful interception system for Blackberry services is ready for use." It added that nine of 10 telecom networks offering Blackberry services were in the process of making it possible for authorities to carry out intercepts. It added that the Canadian firm would soon sign an agreement to hand over its own Mumbai (Bombay) based monitoring equipment and train government officials to use it. "The lawful access capability now available to Blackberry's carrier partners meets the standard required by the government of India for all consumer messaging services offered in the Indian marketplace," it said. "We also wish to underscore, once again, that this enablement of lawful access does not extend to Blackberry Enterprise Server." 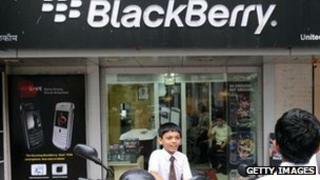 The news has prompted some analysts to wonder if Apple will now become the focus of the Indian government's attention. The iPhone-maker has said that all conversations on its iMessage and Facetime services use end-to-end encryption, so that nobody except the sender and receiver can make sense of them. "India is about to become a very significant market for Apple - demand for premium smartphones is starting to rise quite quickly there among the affluent classes," said Chris Green, a technology analyst at the Davies Murphy Group consultancy. "The pressure will be on it to cut a deal. Apple could either change its system just in India or overhaul its entire messaging system - but that would be awkward in light of the Prism revelations about how the US government carries out surveillance." It may be some time before India is able to make full use of the information it already has access to. A report in the Wall Street Journal earlier this week said the country was having problems with its Centralised Monitoring System - the system which will allow officials to link their equipment up to local telecom and internet service providers. Among the issues reported was the fact that the current version of the software being deployed was not capable of allowing officers to search for specific keywords, meaning they would have to read through every captured message to find the information they wanted. It added that the centralised data centre where the messages would be stored to be analysed was not yet operational, but should be by October.